I live in a small town but, I have to say I seldom see a sign for a town that far from well.... buildings. Back to the issue of City limits of Oklahoma towns, burgs, and holes-in-the-road: A good many of the smaller Oklahoma towns have extended their jurisdiction to many miles beyond their city limits. For example, there's a small town 15 miles south of Watonga which has extended the city jurisdiction 13 miles outside their city limits. 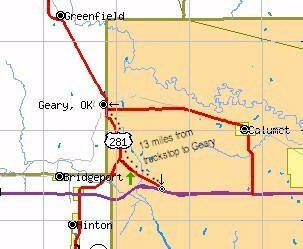 Although the 13 mile stretch of highway (US-281), going from the Cherokee Truckstop on I-40 to Geary is a nonresidential area (nothing but wheat fields, pasture and cattle-grazing area), the Geary city cops patrol the road like the Oklahoma HP. One Sunday morning I was cruising along the road about 9 miles south of Geary thinking about my sermon outline, when I got pulled over by one of these cops. Cost me $87.00. *#@%!